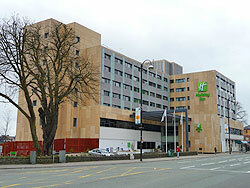 The recently renovated Holiday Inn is one of the closest hotels to the Millennium Stadium. The hotel is located adjacent to the riverside walkway into Gate 1. The hotel consists of 157 guest rooms, plus a hotel restaurant and bar. There is also a public bar called Callaghans, which has been reviewed under the 'Pubs' section for those who are interested. The Holiday Inn is ideally located for tourists but also well placed for businesses to hold meetings and away days. Located next to the Millennium Stadium. On-site parking for up to 85 cars (charges apply). All rooms are fully air conditioned and offer high speed internet access. Hotel Bar serves refreshments and light snacks. Restaurant serves a full a La Carte menu and Kids eat free. Academy Conference offers 11 purpose-built conference rooms. Largest conference room can accommodate 150 delegates in theatre style.